Roentgen, Jaquet-Droz: The robots of the Enlightenment. Jaquet-Droz automata at the Musee d’Art et d’Histoire in Neuchatel, Switzerland. Robots are high-tech and often scary objects, and they have a history that dates back several hundred years. Early in the 20th century, in the early science-fiction era, they were startling fantasy artifacts in novels and movies; during the Great Depression, not unlike today, there was concern that they take away jobs from humans; during the Cold War, as part of a major surge in scientific and engineering research, androids were unique technologies built as research tools at elite educational institutions such as MIT; and most recently, they have become commercially produced commodities like many other electronic consumer goods. An example is iRobot’s Ava 500 Video Collaboration Robot. Going back a little further in history, to the Enlightenment, we see that clockmakers and carpenters built exceptionally sophisticated mechanical androids that were run by clockwork and housed in beautiful decorated cases. Two father-and-son artisan teams, Pierre and Henri-Louis Jaquet-Droz in Switzerland and Abraham and David Roentgen in the Rhine valley near Cologne (Germany), built androids in the 1770s and 1780s that displayed piano-playing women. The artisans used these spectacular objects as gifts for their wealthy and aristocratic clients, who would ornament their mansions and entertain their guests with the curious machines. Since then, robots have become more common, affordable, and functional, and yet they continue to hold a fascination: They put up mirrors in front of us and make us ask questions about ourselves as beings with rights, needs, and desires. This holds for current robots as well as those from former times. Present and past androids share many common features, but they are also markers of historical change: change in technology and design and change in our understanding of ourselves and our artificial mirror images. I learned about the remarkable androids from the 18th century while researching my book published in June, Androids in the Enlightenment: Mechanics, Artisans, and Cultures of the Self. Mechanical androids from that period were, in fact, more spectacular and sophisticated than later ones. That was because the craftsmanship necessary to build them—in mechanics, metalwork, and carpentry—was at its peak in the 1770s, ‘80s, and ‘90s. Never before or after did economic resources and cultural incentives coincide in a way to spawn such sophisticated mechanical objects. We know little about how people in the Enlightenment responded to the androids of their time. Android showings left behind only a small record, and there is no evidence that large numbers of people saw them or were captured by them. 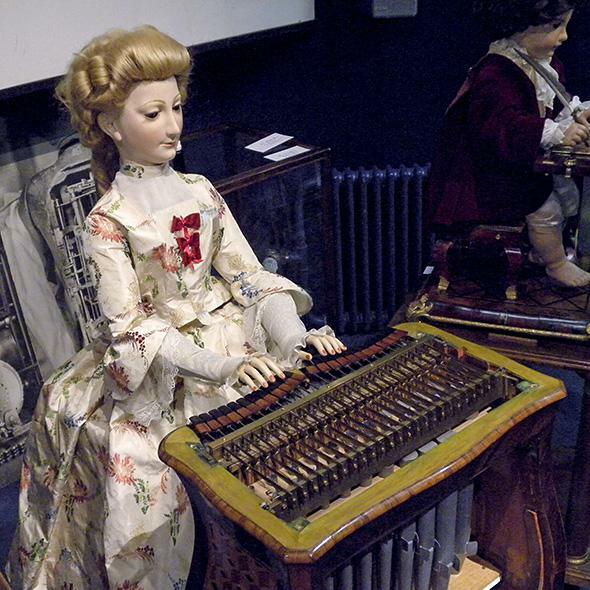 From the 1840s onward, during the blossoming Industrial Revolution, commentators liked to purport that automata in the 1700s provoked wide excitement and were “shown to thousands.” But those commentators may have confused their own large show cultures in the 19th century with 18th-century android showings in elite spaces. The literate, show-attending public was much smaller in the 1700s than in the 1800s and 1900s. In the world of the artisan families Jaquet-Droz and Roentgen, there was no such thing as automated mass production. The social and economic orders in which they lived were made up of courts and courtiers, small workshops, medieval guilds, aristocrats who claimed for themselves a divine right to rule and who needed luxury living quarters to buttress this claim, and social groups (called “estates”) in which people had vastly differing legal, economic, and political status, rights, and privileges. In this complicated 18th-century world, middle classes as we know them now were just beginning to develop a consciousness for themselves as political and economic actors independent of their rulers, and artisans such as the Jaquet-Droz and Roentgen father-and-son teams used mechanical androids to gain access to privileged aristocratic circles. The history of technology provides many examples for often rapid change. In an interesting contrast to that, androids and robots seem to have a timeless, universal quality to them. There is nothing easy or consistent in the ways that they tell us about the foundations of human existence. But we seem to recognize ourselves fairly easily in artificial humans made across historical periods, and they help us, in turn, to express a large variety of concerns about being human in a technological world. It is robots, not just the industrial, the nuclear, or the information ages, that provoke in us a desire to reassure ourselves that we really are human, not merely machines.